An excerpt from Japan's "Protecting Ourselves against Armed Attacks and Terrorism" guide. Get indoors, keep away from windows and switch on the TV. That’s the latest advice from the government on how to prepare for a ballistic missile strike. Japan has an early-warning system designed to issue alerts across the country from loudspeakers and mobile phones if a missile is thought to be heading its way. The J-Alert system has come under renewed focus since North Korea test-fired a volley of four ballistic missiles last month, three of which landed in Japan’s exclusive economic zone. A ballistic missile would probably take about 10 minutes to fly the 1,600 km (1,000 miles) from its launchpad in North Korea to the island of Okinawa, the government said in a document published Friday on its civil protection website. But Japan’s two-phase missile-defense system isn’t considered foolproof. While the public has long lived with the threat of attack by North Korea, fears have grown in recent weeks because ballistic missile tests from Kim Jong Un have prompted the Trump administration to warn that it is willing to use military force against his regime. According to the government pamphlet, if there are no robust buildings nearby, residents should get to the ground and cover their heads. If driving, they should stop as soon as safely possible and get away from the vehicle. And if a missile has actually landed nearby, it’s best to cover your nose and mouth with a handkerchief and quickly get away. 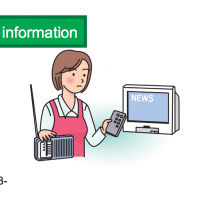 The documents are the latest additions to a website offering advice in Japanese and English about how to prepare for a number of emergencies, including invasion by ship or an attack by warplanes.